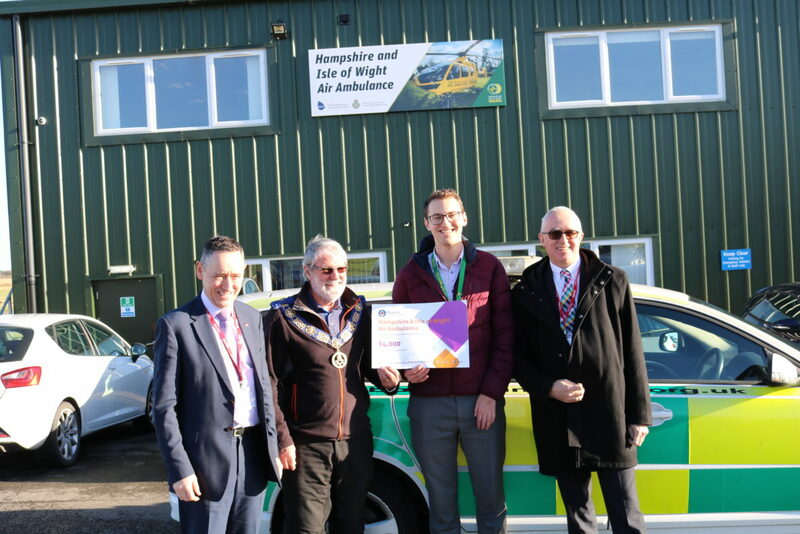 On Thursday 17th January we welcomed members of the Provincial Grand Lodge of Hampshire and Isle of Wight to our Airbase, as a way of saying thank you for their continued support. On the day, Provincial Grand Master, Right Worshipful Brother Michael Wilks presented us with a generous donation of £4,000 on behalf of the Masonic Charitable Foundation. The Masonic Charitable Foundation are fantastic supporters of Air Ambulance charities nationally and have raised substantial sums to help keep the services operational. This donation is part of £192,000 being donated to the 26 Air Ambulance charities across the country. Michael was joined by Worshipful Brother, Kevin Head, Provincial Grand Charity Steward, and Worshipful Brother, James Sampson, who presented us with a cheque for over £2,500 on behalf of the Hampshire and Isle of Wight Provincial Grand Stewards Lodge No.9263. A donation of £200 was also given on behalf of Brockenhurst Lodge 7040.